Mandragora officinarum L., Sp. Pl. 1: 181. 1753. Atropa mandragora L., Syst. nal 10th ed. : 933. 1759), nom. illeg. (Art. 52.1. Mandragora foemina Garsault, Fig. pi. med. 3: 221, t. 363 p.p. . 1764. Mandragora mas Garsault, Fig. pi. med. 3: 221, t. 363 p.p.. 1764. Mandragora acaulis Gaertn., Fruct. sem. pi. 2: 236, t. 131. 1791. Atropa humilis Salisb., Prodr. stirp. Chap. Allerton: 132. 1796. Atropa acaulis Stokes, Bot. mat. med. 1: 396. 1812. Mandragora autumnalis Bertol., Elench. plant, viv. : 6. 1820. Mandragora vernalis Bertol., Virid. Bonon. veg. : 6. 1824. Mandragora praecox Sweet, Brit.fl. gard. 2: t. 198. 1827. Mandragora neglecta G. Don ex Loudon, Hon. brit. : 71. 1830. Mandragora microcarpa Bertol., Comm. Mandrag. : 12, t. 3. 1835. Mandragora haussknechtii Heldr. in Mitt. Geogr. Ges. Jena. 4: 77, app.. 1886. Mandragora ×hybrida Hausskn. & Heldr. in Mitt. Geogr. Ges. Jena. 4:77. 1886. Mandragora hispanica Vierh. in Osterr. Bot. Z. 65: 132–133. 1915. USDA, ARS, Germplasm Resources Information Network. Mandragora officinarum in the Germplasm Resources Information Network (GRIN), U.S. Department of Agriculture Agricultural Research Service. Accessed on 09-Oct-10. Ungricht, S., Knapp, S., Press, J.R. (1998) A revision of the genus Mandragora (Solanaceae). Bull-Nat-Hist-Mus,-Bot-ser. London : The Natural History Museum v. 28 (1) p. 17-40. 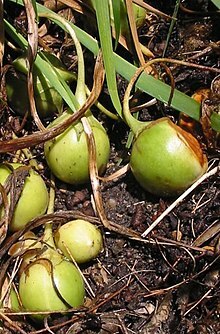 For more multimedia, look at Mandragora officinarum on Wikimedia Commons. This page was last edited on 2 February 2019, at 19:27.